The kitchen area is sometimes one of the most daunting areas to think of in terms of small space. The idea of not having the capability to whip up a 14-course meal and serve mammoth trays of hors d’oeuvre is almost frightening to us. What if the entire garden club drops by unexpectedly for dinner? Before you panic at the thought of giving up your mega appliances, ask yourself when was the last time you cooked with all four stovetop burners simultaneously? And if you moved all the expired food in your refrigerator to the dust bin, how much space would you really need in the chiller? It may be that your lifestyle is more suited to small space living than you had originally thought. 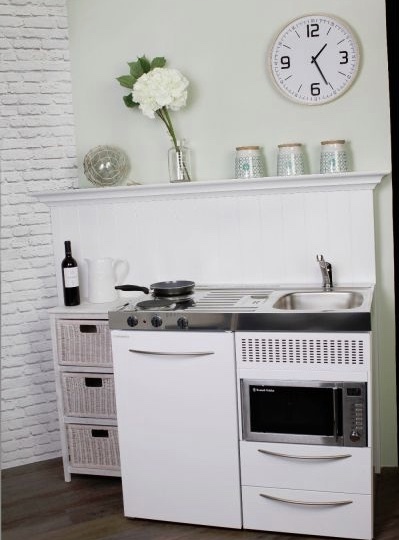 Originally an Italian company, Smeg was established in the UK in 1989 and Smeg UK is currently based in Oxfordshire. Their refrigerator line is particularly useful in small spaces. The tall, narrow shape makes clever use of vertical space. –And the designs! 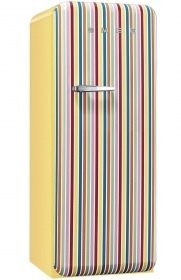 The addition of one of their products, such as the retro stripe version pictured below, will make a statement that your entire kitchen can be designed around. Though they are billed as a retro design, the sleek lines could work just as easily in a contemporary space and come in unusual colors such as lime green and pink. They also currently offer a refrigerator emblazoned with the Union Jack on the front. This UK based company has specialised in providing small space kitchen units for the past ten years for studio flats, student housing and office kitchens, just like the one pictured at left. It just so happens that their neatly fitted, compact kitchens work well in a tiny house as well. They recently released a new range of economical compact kitchens that will fit both a small space and a small budget. The unit has a microwave, 2 hotplates, a fridge with a freezer compartment, and a sink with a monobloc tap. This company located in Blackburn, Lancashire offers compact kitchens by several different well-known manufacturers. They are one of the main authorised dealers for Space Savers UK. Their staff is highly experienced in fitting customers with the right kitchen and they offer free delivery in the UK on orders over 100 GBP. Definitely worth a look at the selection on their website! For more small space appliance ideas, visit our Pinterest site.